To Skip, Thanks for all the work on our off-duty gear and for baby sitting us! 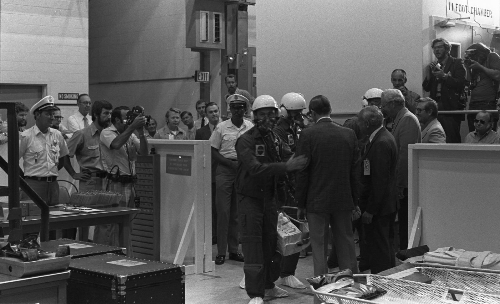 In the summer of 1972, NASA’s Manned Spacecraft Center (as the Lyndon B. Johnson Space Center was then called) in Houston, Texas, conducted a 56-day test vacuum chamber test to evaluate equipment and procedures proposed for use in the Skylab missions. 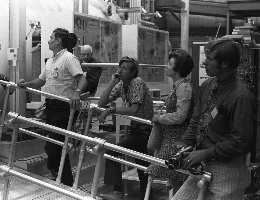 They also wanted to get a baseline of physiological data for crewmembers confined in a test chamber at 1-G to compare to the crews in Skylab at Zero-G. The chamber was operated at a pressure of 5 psia (about 1/3 normal atmospheric pressure and equal to an altitude of 27,000 feet. The oxygen level was 70% - compared to 21% in normal air. 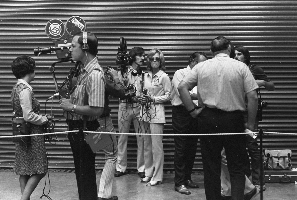 Crew Systems Division was responsible for facilities and operations and the Systems Test Branch of CSD was responsible for preparing the facilities and the operating procedures and for controlling test operations. 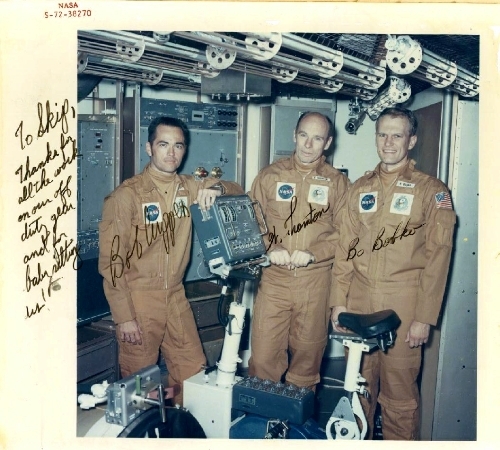 Astronauts Bob Crippen, Karol “Bo” Bobko, and Dr. William Thornton were the test crew members. They presented me the signed photograph above following the test. Everyone got a memento of some sort. NASA is not responsible for the accuracy of any information contained on these pages. The opinions expressed are the author's alone and not the opinions of NASA.. The First Day - MSC had invited the press to film the crew entry. 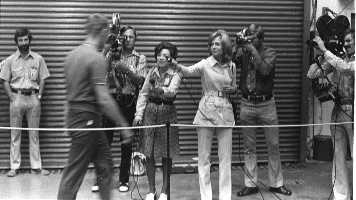 I was a fan of Jessica Savitch so I was pleased that she was there reporting for one of the local TV stations. The press team waited outside the medical examining room hoping to get comments from the crew as their exams were completed and they went upstars to the 'prebreathe' room. Apparently the crew had not planned to make pre-test comments. They quickly moved through the press gauntlet and went upstairs. While the crew donned their chamber coveralls and oxygen masks in the prebreathe room, the press time moved to the a location near the entrance to the SMEAT test chamber area. The crew shook hands with NASA dignitaries and didn’t speak with the press because at this point they had their oxygen masks on. They went immediately into the chamber. In this photo Crippen seems to be looking directly at my camera. The press team moved around to the chamber entrance area and waited for the crew members to come back to the chamber.